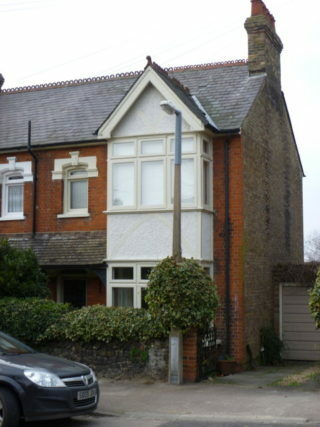 I remember living in the family house at 4 Jeffries Road, Ware, the 1939-45 war was over, the sun always shone, I was at ‘big school’ and shopping still meant walking to the local shop. You knew the milkman, paperboy and postman who called at the same time each day. The baker, laundryman, greengrocer, dustman and coalman arrived like clockwork. Now and then a ‘Rag and Bone man’ would come along the road, or a shady looking travelling salesmen would appear on the doorstep to be hustled away and never seen again. In the summertime a ‘Tramp’ would often shuffle down to the door asking for hot water or tea. To me he always looked like the same one and I often wondered where he went in winter. Apart from the weekday paper boy they all came to the back door. This involved opening our six foot high wooden side gate, a particularly neglected specimen with life-threatening wood rot, rusty hinges and stiff latch. No one came unannounced. You knew everyone living nearby and as few people moved away there wasn’t much opportunity for strangers to move in. If they did they were viewed with suspicion until they proved to be of ‘sound character’. Our nearest shops, Harris’s, in what was the front room of a house in Vicarage Road and Harringtons, more of a purpose built shop in Cross Street, were both a short walk away. Harris’s was a small general store for non-perishable items while Harringtons sold ‘Provisions’. Most days I would be sent to one or the other for essential items – no families had fridges then – still, neither did the shops. After being ‘at sea’ for many years Mr. Harris had taken on his shop for retirement. I now realise he and his wife, Fanny, spoke with strong Liverpool accents, which as far as the locals were concerned was a foreign tongue originating from some god-forsaken part of the British Empire, but this was the days of real shops when you knew who you were dealing with and Harris’s must have been the original ‘Open all Hours’. Responsibility for any ‘product shortage’ was laid firmly at the door of the ‘Wholesalers’, or the ‘Old Sailors’ as my Grandmother thought he meant, a misunderstanding easily explained as she was completely baffled by Harris’s strong Scouse accent. His association with the sea and an uncanny resemblance to Popeye only reinforced her belief. Often I went into the shop during the evening, setting the door bell tinkling, which brought one of them in from the back room with their mouth betraying intimate involvement with a meal. The Harrington brothers were completely different, ‘Pinky and Perky’ described them perfectly. Both were round and dumpy, very much alike, reliable and well fed, a perfect caricature of local corner shop owners. Both wore striped aprons, number one always wore a trilby hat so, unsurprisingly, was known as ‘Hat’, number two never made any effort to disguise his bald head. 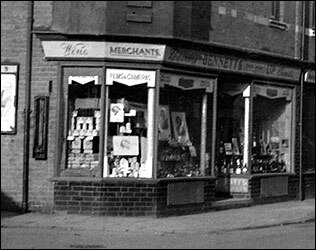 Their shop was at the corner of Cross Street and Raynsford Road. There were ornate wooden surrounds to the large low windows and the wide door had a very sensitive bell dangling on the inside. Why this was needed was a bit of a mystery as one of ‘the boys’ or Mrs. Tomlin, their trusted assistant, were always in the shop. The well-worn mosaic tiled floor had a yellow and blue pattern and all the shop fittings were wooden or brass. Perhaps the chair beside the counter was an early attempt at ‘retail psychology’ aimed at the predominately ageing customers. But I was fascinated with the shiny red and silver bacon slicer. The smooth wooden handle was used to turn a large metal wheel geared to spin a vicious shining blade at high speed while the joint of bacon was held against it. A smooth metallic ringing sound was made by the revolving blade as it easily sliced through the meat. How I longed to turn that handle. Portions of butter and cheese were cut from blocks. Sugar, salt and tea was taken from jars and weighed out on a set of large antique scales using brass weights, then expertly wrapped in paper or put in a bag. Below the front of the counter and cunningly tilted towards hungry boys were glass topped boxes filled with biscuits. Broken ones went in the box nearest the door. Each local shop had its own characteristic smell, perhaps bread, bacon, polish, disinfectant or even paraffin. Sadly these friendly shops have gone, replaced by clinical air-conditioned ‘retail outlets’ filled with humming freezers and staffed by dull, remote individuals programmed to carry out their own pre-determined task and go home. 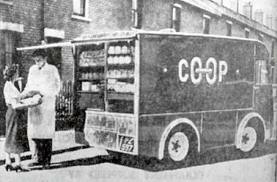 Mr. Hall who lived near Harringtons shop was our Co-op milkman. He always looked if he had the worries of the world to contend with. Like all callers he came to the back door and only stopped on Fridays long enough to collect the money, writing out the small receipt slip used to claim the Co-op ‘Divi’. The weekday paperboy, who was never seen, delivered the ‘News Chronicle’, but on Sunday mornings Fred Munt, another local, arrived with the Sunday Graphic, Sunday Express and varying combinations of his children. He came round to the back door to exchange local gossip. Twice every weekday, and once on Saturdays, ‘Mr. Page the Postman’ happily delivered letters to the back door, they only came through the front door when he was on holiday, he was another who lived nearby – in Garland Road and he soon discovered he shared his birthday with my sister Margaret, always delivering his own card for her. He knew everyone on his round, and most of what went on. He and his wife were staunch members of the Congregational Church, a way of life he quietly took out with the post. I can only remember the baker as a short tubby man with thick rimmed glasses. He came several times a week in a dull red Co-op van bringing the bread to the back door in a large wicker ‘bread basket’, nothing else but loaves, large and small, brown and white, fresh from the Co-op bakery half a mile away. Washing machines had not yet been invented so the ‘Snowdrop Laundry’ washed any big items, sheets, pillowcases, tablecloths etc. The first time any article was sent, a small white label with your laundry number in green was stitched to it. Our number was 242. All items for collection were written in a green ‘laundry book’ which was put with the washing in a pillowcase and left by the back door. The laundry man came in a scruffy, flat fronted, faded green van twice a week, once to collect the dirty washing, and the money for last week’s laundry, and again to bring back the freshly laundered items wrapped in a brown paper parcel tied with white string, with the updated laundry book slipped underneath. Mr. Bell from New Road came with greengrocery set out on a cart drawn by a bedraggled old horse that couldn’t hurry but knew exactly where to stop. Mr. Bell walked, calling at the back doors of all his regular customers who then usually went out to the cart to choose their goods. He always wore a battered trilby hat, greasy jacket and baggy trousers but sold good fresh vegetables. (There was no other kind then.) And after the war when I was about eleven years old I had my first banana from him. The poor old horse being a creature of habit was held in high esteem by my father as ‘manure’ was regularly deposited in the road. With father at work it was the job of mother to harvest this precious commodity before it was shovelled up by someone else. Once a week the dustcart came round. No plastic sacks or wheelie bins then so every house had a metal dustbin. The dustcart was a strange vehicle with a bench in the cab for the driver and dustmen to sit on and a noisy engine that was connected to the wheels with a large exposed chain. The controls in the cab looked most complicated, mounted on a shelf under the windscreen there was a steering wheel and two rotary brass handles, presumably one to control the speed and the other the brake. These controls were spread across the width of the cab so the poor old driver had to drive standing up. It was a custom-built dustcart designed for tipping the contents of dustbins into, with each side of the low vehicle having three curved sliding metal lids to keep the rubbish in. The dustmen fetched the bin from the back of the house, emptied it into cart and brought it back which involved a lot of loud clanging and clouds of dust. At this time the dustmen wore their own clothes, and not until sometime later were they issued with overalls and a leather shoulder pad to take the weight of the bin. However, they were cheerful and were always known as Mr . . . . If any rubbish dropped it was immediately cleared up, and they were always helpful and cheerful. When the cart was full it was driven to the rubbish pit in Wengeo Lane, the tail board was released and a tipper mechanism did the rest. Some of the new houses in The Hyde must be built on that tip, but don’t tell anyone it was me who told you! There was another way to get rid of unwanted items. Every now and again you would hear a hand-bell accompanied by an unrecognisable string of words. We children always heard this a long way off and rushed indoors shouting “Rag and Bone Man’s coming”, and if there was anything to be ‘got rid of’ we would be sent out to call him round. They gave little or no money for anything, as they knew most households were grateful to unload their old items. Coal for our fires was tipped in the coal shed, next to the back door, by Mr. Harrison who carried each thick black canvas one-hundredweight sack (just over 50kg) on his back and no one could convince me that the veins of Iron Pyrites in the shiny black lumps that thundered out were not gold. We always stocked up during the summer when the coal was cheaper but, by March, it had all been used, apart from the small pieces and lots of dust which were carefully put into thick paper bags. A sticky black substance was poured in to hold the contents together, and these ‘briquettes’ would be burnt until the next delivery. I was fascinated by one other regular caller, Mr Miller the ‘Kleeneze Man’, a genuine travelling salesman, who lived in Coronation Road, Ware. He came to the back door dressed in smart suit, tie and highly polished shoes, wearing a trilby hat at a slight angle and sporting a well trimmed moustache. He noisily heaved his gigantic suitcase on to the doorstep and opened it with a flourish. It was filled to overflowing with all shapes, sizes and colours of brushes, mops, soaps, polishes, dusters and kitchen gadgets which all looked so new and gave off a wonderful smell. He demonstrated his goods with pride and enthusiasm, I’m sure he imagined himself as an entertainer, revelling in his moment of glory. He seldom left without a sale and it would be no surprise to find that most of his merchandise is still serviceable and in regular use somewhere today. Life was more difficult then, needs and expectations were minimal and life revolved entirely around family, friends and the neighbourhood, ensuring a ‘code of practice’ that could be adopted to advantage in today’s world. Sadly, no one comes to the back door now. This page was added on 05/03/2011. How well I remember Mr Harris and his fascinating shop. We lived at 79 Musley Lane. When I had sixpence, I’d buy three small cakes. These were wonderfully tasty. Mr Harris kept them in a tray on his counter. If rich, I would buy a small bottle of tizer to accompany my cakes. Tizer somehow, does not quite taste the same today. Mr Harris could be a little ‘grumpy’, but the memories of that shop have never left me.